2nd Floor -- King Bed - Queen Bed -- Sofa Sleeper -- You'll enjoy this roomy condo overlooking the Gulf! The Living Room beachfront view you will always remember. Relax with a Beachfront View from the Balcony. You will enjoy this gorgeous view of the gulf water and sugar-white beach Newly remodeled kitchen with granite counter-top bar. Mirrored Wall -- New furniture. Sink into the supple leather sleeper sofa. New relaxing recliner too Master bedroom has a walk-out balcony with view of the beach Sleep late while on vacation in the Comfy King Bed in the master bedroom. Wake-up with your favorite morning show or doze off at bedtime with the conveniently wall mounted flat screen TV. Your guests are welcomed with a Comfy Queen Bed in the 2nd Bedroom. You`ll enjoy the comfortable casual dining for six. Newly remodeled Master Bath adjoins the master bedroom for your convenience and privacy. Two 2 bathrooms for your convenience. You`ll enjoy the new 4-star guest bathroom. Rest and relax on the gulf view balcony after a fun day at the beach. Full size Washer and Dryer in the condo. Gorgeous view. Photo taken from the balcony of Maravilla 2201 In Destin. Large shady umbrella and 2 beach recliners included free for you March-October Take a stress-free stroll along the beachfront boardwalk along Scenic Gulf Drive, just in front of your place. Maravilla`s front pool is just steps to the Coastline. Includes BBQ grills and plenty of poolside seating. The 2nd Pool on the north side of the property pool is heated in winter. Relaxing Hot Tub is located near the 2nd Pool. Heated year-round. Sunrise over the Gulf of Mexico. South-facing beach offers sunrise in the morning and sunset in the evening. Local guy taking on the waves during frothy gulf coast action. Just steps to the beach from your condo. Private beach for you and other Maravilla guests only. You can keep your exercise routine at Maravilla. Tennis Courts are free for Maravilla guests. First come, first serve Welcome to Maravilla. Gated entrance on Hiway 98. A restful getaway day begins at Maravilla. Another view of the front pool, just steps to the beach. In the evening, relax in the gazebo with your favorite beverage. Welcome to Maravilla. 2606 Scenic Gulf Dr. Gated entrance near the Gulf. Gated access to the Private Beach for Maravilla guests only. Enjoy the clean and pristine sugar-white beach at Maravilla. Plenty of free parking, conveniently close to your place. Sometimes only a picture can express the beauty and tranquility waiting at Maravilla. Tropical Treasure is NEW to our program -- available March 10, 2018. Book today and plan your 2018 spring break and summer vacation now!! 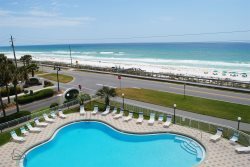 You'll enjoy vacationing in "Tropical Treasure" a 2 bedroom, 2 bath condo overlooking the crystal blue waters and sugar-white beaches of Destin. Spectacular views await you as you step out onto the large 2nd floor balcony. Enjoy an ocean view from the master bedroom. Open the balcony door and listen to the gentle waves lapping onto the seashore below. Enjoy a beachfront water view from your living room too! This beautiful property has been masterfully renovated with new kitchen cabinets, granite counters and lovely leather furniture. So beautifully done. Here are some reasons you will love this place. Enjoy a panoramic beachfront view from the corner condo. Relax and save money with free Beach Set-ups (2 Chairs & Umbrella) included. "The condo was lovely. The decor was beautiful. We felt right at home. It had everything we needed and more with a gorgeous view. I loved having chair service on the private beach each morning. The corner unit was a plus." My husband and I enjoyed your condo very much. Directly across the street from the private beach and very well located to restaurants and shopping some even in walking distance. The bed in the master was soooo comfortable.The balcony was awesome with open view of the ocean, sun rises and then sunsets.We plan on staying here again. Thank you for sharing your condo with us and being so helpful. Sandra stayed at Maravilla 2201 in October 2016.